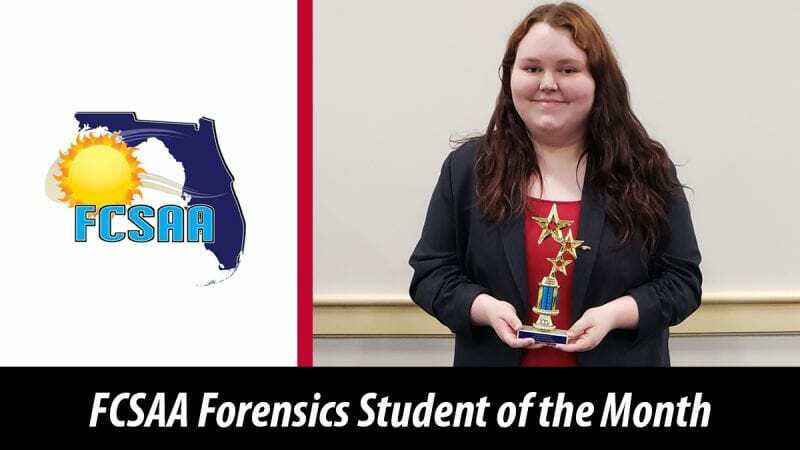 Polk State College student and Speech and Debate Team member Angel Green was named the Florida College System Activities Association’s (FCSAA) Forensics Student of the Month for November. Green, a student pursuing an Associate in Arts degree with a major in Social Work, is the Speech and Debate Team’s newest member and has already received a scholarship for her award-winning participation in the group. She plans to transfer to the University of Central Florida to study Political Science and aspires to work in the medical or legal field to advocate for at-risk youth. The Polk State District Board of Trustees recognized Green on Jan. 28 for her accomplishments. “I am so humbled to receive this recognition, and I am excited to see where Speech and Debate takes me,” she added. The Speech and Debate Team enjoyed a successful 2018, placing second overall in the Capital City Classic tournament in the state college division, reaching finals at multiple tournament events, winning a number of awards at the Star Invitational, and participating at the national level in the Phi Rho Pi tournament. Interested students should contact Professor Gesmundo at 863.669.4950 or at cgesmundo@polk.edu.